Higher revenue from economic growth and taking market share in the less-than-truckload shipping business led to another earnings beat. 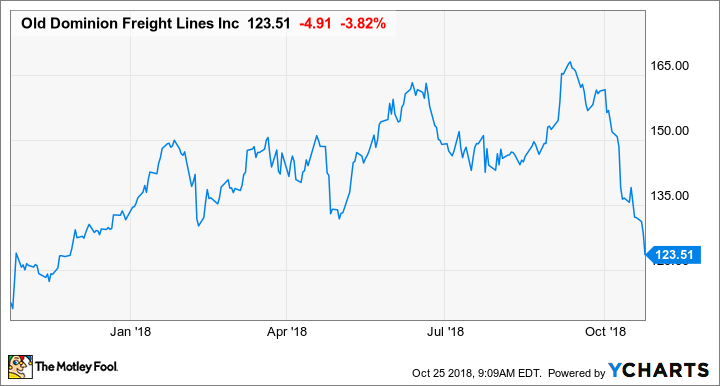 Old Dominion Freight Line (NASDAQ:ODFL) has built a reputation lately for surpassing analyst expectations. This quarter was no different as the company cruised past third-quarter earnings estimates to post record levels of revenue and profitability. Here's a quick rundown of the company's most recent results and a look at whether investors can expect more performances like this one in the future. DATA SOURCE: OLD DOMINION FREIGHT LINE EARNINGS RELEASE. EPS = EARNINGS PER SHARE. What happened with Old Dominion Freight Line this quarter? As in the prior quarter, the company absolutely crushed every metric that measures revenue and operating efficiency. Less-than-truckload (LTL) tons and total shipments were up 8.1% and 9.7%, respectively, while total intercity miles increased by 10.7%. The only operating metric to slide this past quarter was weight per shipment, which declined 1.4%. Weight per shipment can typically be a sign of a slowing economy, but management said that this decline was more a reflection of some operational changes designed to reduce heavy-weighted shipments on its network. The company continues to expand its service, with total headcount increasing by 16.2%. Revenue growth has outpaced service growth, though, such that wages and compensation are now only 50.7% of total revenue. Old Dominion Freight Line ended the quarter with a record-best operating ratio -- operating expenses divided by revenue -- of 78.4%. Higher revenue and more-efficient operations are generating free cash flow that management is able to give back to shareholders. So far in 2018, the company has spent $76.6 million on share repurchases that have lowered its share count by 0.5%. This is on top of the company's higher capital spending, which has helped it take market share recently. The quarterly results once again reflect the consistent execution of our long-term business strategy of providing on-time, claims-free service at a fair price. While this strategy has allowed us to increase our market share significantly over time -- regardless of the economic environment -- our ability to grow requires consistent investments in capacity, technology, and our employees. Our OD Family of employees remains committed to providing our customers with the best service in the industry, which gives us confidence in Old Dominion's ability to produce further profitable growth and increase shareholder value. The trucking industry, like railroads, has been a barometer of economic health for years. That is part of the reason earnings have been increasing at such a blistering pace recently. It isn't the only factor, though, as the implementation of electronic logging devices is putting greater pressure on the full-truckload (FTL) business. Those devices mean that drivers can't be creative with their paper hourly driving logs and run longer than legally mandated to make a shipment. That is forcing some customers to move some of their shipments from FTL shippers to LTL shippers, because LTL shippers have extensive distribution and service centers that can switch out drivers. The FTL business is multiples larger than the LTL business, so any small change in the percentage is of huge benefit to Old Dominion Freight Line and other LTL shippers. If LTL shippers can pick up a decent amount of traffic from FTL shippers, it could help offset any weakness that could arise with a slowing economy. That should help Old Dominion Freight Line continue to post great earnings results in future quarters.